Close up of the guy turn buckles, equalizing plate and anchor rod. The rigger wired all turnbuckles as a safety precaution. The bolt passing through the "D" shackles has a large nut on the opposite side and is locked with a split pin. I Later added a 10 mm earth wire, bonding each of the three guy wires together above the turnbuckles. One of the two water pipes can be seen in the background covered with an orange plastic bag. 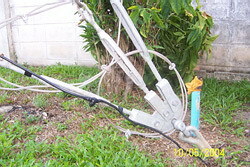 Notice the angle of anchor rod which was designed at a mean angle to all three guy wires. Looking at the equalizing plate it looks about right. 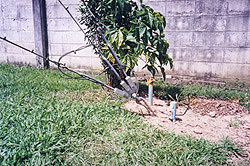 Another view of the same anchor block, taken shortly after installation and before the grass has grown.